Andy Bales, president of Union Rescue Mission [URM] and a former Biola student, works with those experiencing homelessness every day. In the midst of crime, violence and brokenness of Los Angeles Skid Row, he works towards providing a place of safety and care. 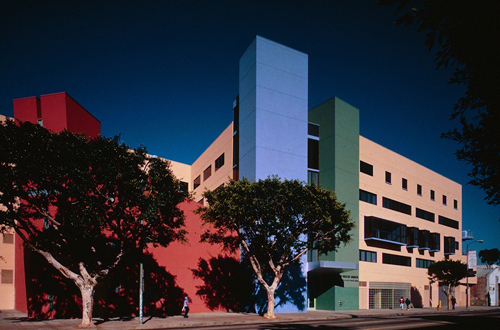 Founded by Lyman Stewart, one of Biola’s founders, URM is one of the largest rescue missions of its kind in the United States and the oldest in Los Angeles. Bales gave Biola’s Fall Commencement address on Dec. 17, 2010, and recently answered a few questions about life at URM. 1. What inspired you to first get involved at Union Rescue Mission? I was inspired to come here to serve by my father, who experienced homelessness as a child, and a sermon that I shared from Matthew 25:31. I preached the message six times on a Friday to Christian school students who I hoped would change their attitudes toward the least of these, the "losers" of the world. I told them that the way they treated others was the way they treated God. If they fed a hungry person, it was like feeding Jesus himself. That Sunday, a man experiencing homelessness approached me and asked for my sandwich. I turned him away. It felt like a hammer from heaven hit me in the head. I hadn't practiced what I preached. I found him on the streets several weeks later, fed him, and began to practice what I preach. That was 24 years ago. 2. What is the atmosphere like at Union Rescue Mission during Christmas? Staff and some guests are festive, readying for our Christmas Store where we provide gifts for 1,200 or more families. Children are both grumpy and excited. However, some guests are really hurting as they long for family and a home. We try to make it as nice and like home as possible, with nice parties and even a steak dinner and gifts for all on Christmas Eve. We have people who have been blessed in the past who now not only volunteer, but work here in a ministry. A sweet lady today just thanked me and held my hand for a long time as she thanked me because we were able to provide her with an apartment full of furniture after she moved into a new apartment. Lots of kids and parents thanked me as well today as they shopped for each other in our URM Christmas Store. I really love helping bring joy to people. 3. Biola students traveled to URM last January to write a book titled, Skid Row. A few of the students have been able to return to URM and volunteer or spend time with some of the residents. Many students were impacted by those they interacted with. You make a large impact on these people every day. What impact do they make on you? I have never met a person experiencing homelessness that I haven't loved. They fill me with love. Serving here brings me joy and fulfillment. I look forward to going to work every day. I can't wait to get here. I am so blessed and honored to be here. 4. How can the Biola community pray specifically for URM and what needs do people have during Christmas time at URM? Friends, celebration and joy. Warm clothes and coats. Pray for our guests, their sorrows and hurts at Christmas time. Pray for a special touch from the Lord at this time, especially for the children, that they might feel God's presence and love during the holidays. Pray for sufficient resources to come in during the holidays to carry on this work. Consider stopping by and wishing us cheer or singing carols.